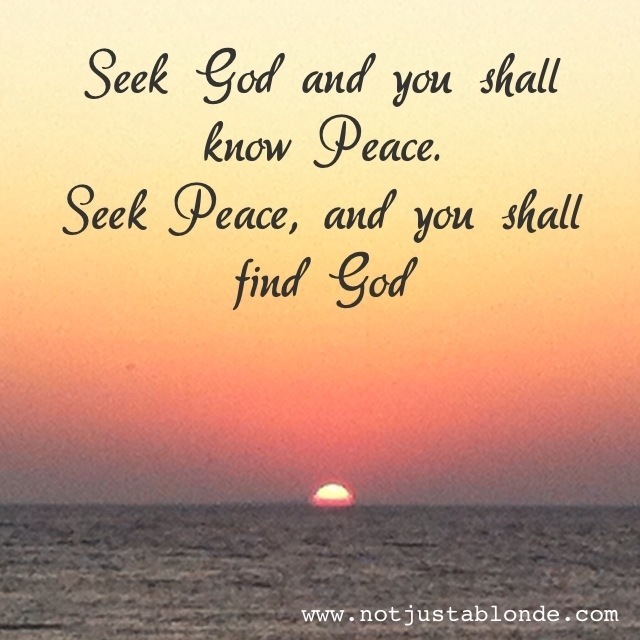 Seek and you will find… yes, it really is that simple. I think sometimes we think finding God in this life & hearing his Voice is complicated or tricky, with a pure heart and a loving mind He is present and ready to answer any question at any time. He wants us at Peace and he desires our better good. Our best is always with Him. He knows All and therefore has the Best Vision for our lives. Fear can cloud His ability to direct us. Discernment and fear are not the same. We must only listen to His Voice of Peace and Love. If we seek the truth we will find it. What truth do we wish for? The truth of man or His Truth? God does not try to trick us nor does He take pleasure in keeping the Truth hidden. The path towards Him is neither complicated nor difficult… if we are truly with Him along the way. When we are anxious, when things get scary or seem overwhelming it is a sure sign we are not relaxing in His Arms and that once again we are relying on our own Earthly strength and understanding and not in His. He is more powerful & loving than any difficulty or deception! We simply must relax in Him and listen to His Voice for guidance! I was recently warned by a dear God loving friend that sometimes the voice we think is God’s may not truly be His. She cautioned that although this imposter voice might speak near truth that this voice means to do us harm and lead us away from the Truth of God. This scared me… actually, it down right freaked me out!! My body became tense and rigid, and fear trickled through my core. How could I ever know what voice to follow and be sure it is the Voice I am seeking? She insisted we needed to question each message against His Word. So every time I hear His Voice I am to question Him? By “His Word” I am pretty sure she meant the Bible… but that’s where things can get even more difficult! For every Bible story and verse there is a different understanding… and for each interpretation there is the likelihood someone got it wrong. All you have to do is attend a few different Bible studies in a few different Churches to see quickly how many different understandings there can be! Confusing… difficult… contradictory… divisive… sigh. Who’s right? Who’s wrong? What’s a girl to believe? This is when I turned to God in the darkness, with my 3 boys sleeping nearby. In the quiet solitude of the night, I turned to God and He answered me. Simply. I was still and listened without fear and with an open heart and mind. His message came clear and without complication… His Voice as familiar to my ear as His Love is to my soul. I’m not to fear the Enemy but turn to Him with all my thoughts, my anxieties & fears and He will guide me & keep me safe. Fear not as He is with me Always. I will know His Voice by His Peace & His Love. The gift of discernment is just that: a gift. Without special effort or works Gods Voice is clear and consistent. His Loving guidance resonates unlike any potential imposter… as our God can be recognized by His Love and Peace that cannot be received from an other god or source but Him. He is the Only Living God… the only True Voice above all. Simply: He will always reveal Himself to us. He is never hidden from us, nor silent. We must but be still and listen. God gave me some Bible verses… mostly I think to ease all fears and for Loving reassurance. I totally agree! Thank you for sharing your thoughts! !